In light of the events of the last month, as much as those of the last few days, it is time to reflect. The passing of a slightly revised version of the “Budget Repair Bill” requires that we do so for what we are calling our movement has been based largely, arguably entirely, on killing that bill. Republicans are unmoved by demonstrations and any other call for them to carry through the will of the people. It is a testament to the strength of the movement that Republicans were forced to pass the bill only with the use of police force and by disregarding legislative procedure. In order to sustain our momentum and especially in order to escalate the struggle—in the short term and long term—we need to identify new sites and targets for action, build meaningful alliances that expand the base of the movement, and avoid being ensnared by legal battles or subsumed by the Democratic Party. With both union and Democratic Party officials offering to concede much of the bill so long as the right to bargain collectively is not constricted many worried that Walker would simply remove that item from the bill, welcome the 14 Democratic Senators home and pass the remaining austerity measures and other neoliberal wet dreams. It was clear enough from the get-go that key provisions of the “Budget Repair Bill” had as much to do with repairing the budget as the Patriot Act had to do with patriotism. Since the quorum of 20 Senators is needed only for budgetary items Walker and much of the public knew all along that if the governor would simply call the bill what it is—an anti-union law—he would be able to pass it through with or without the presence of the Democrats. The only reason to hesitate was that in doing so they would lay bare their true intentions of consolidating ruling class power. That is exactly what the Republicans did. But the quorum was not the only barrier to signing the bill. It was not even the main barrier—those pesky masses that were becoming increasingly emboldened by their collective action and their growing numbers were the real hurdle. They spent all night in public hearings (some were state-sanctioned, others were not) raving against the bill—keeping the capitol building open all hours—and they used their presence to blockade the Senate and Assembly chambers. The de facto strike of the teachers of Madison inspired student walk-outs and mass action here in Wisconsin and around the nation. The Republican strategy of pitting the already dispossessed private sector workers against public sector workers ultimately failed. * In the struggle over the capitol building there were instances when the police were forced to cede control of the capitol to the masses of emboldened people, though these were not decisive moments. When protesters thinned out police regrouped and took control. With “public opinion” already siding with the unions the Republicans likely understood that any restraint or pretense for democratic process was yielding decreasing returns. The bourgeois-democracy façade was thrown out the window, along with thousands of protesters and a few Democratic Party representatives. They gave up claiming to represent the will of the people. Republicans even recognized on the assembly floor the overwhelming opposition to the bill. To move past that opposition they called on the State Troopers, whose appointed head is Stephen Fitzgerald—father of the two most powerful Republican legislators in Wisconsin. (But to be true to record they first called the Madison Police Department; they settled for the Troopers on Wednesday, March 9th after Madison Police Chief Wray refused to remove demonstrators from the capitol.) It was only through vague threats of arrest for being in contempt of court (up to six months in jail) and then physical removal that the Assembly chamber was opened for “business.” After months of delay, the Republicans decided they better move as fast as possible. Rules schmules, this bill was going through. Nonetheless there is no doubt that protesters made the passage of the bill uncertain, forced Republicans to remove outrageous privatization schemes and ultimately are to thank for any upcoming legal investigation that finds that Republicans broke procedural rules (thus nullifying the bill) and trampled constitutional rights in the process of passing the bill. And now some of Walker’s fellow governors are reconsidering their anti-union posture as they witness the growth of a new labor movement. Especially since the bill, SB 11, was amended so as to not include “spending items” most attention has been focused on the limitations it imposes on collective bargaining, in other words the union-busting aspects of the bill. I have outlined thirteen important items in the bill. All references to employers and employees refer to the public sector only. Public safety employees—including firefighters and police—are not included in much of this, but are dealt with separately. So what was removed from SB 11? Of the mere six pages that were removed from the original monstrosity were the no-bid sale of power plants to private corporations and the restructuring of public debt. Public Employee Wage Increases Will be Tied to the Consumer Price Index, Unless Passed in Referendum. If any local governmental body (city, village, town, county, metropolitan sewage district, long-term care district, transit authority, or local cultural arts district) wishes to raise base wages above the Consumer Price Index (CPI) then the governing body must adopt a resolution to that effect, specifying the current total base wages, the proposed total base wage, what percentile increase that would be over the CPI, and what percentage increase in wages it would be. Public Employees Must Pay ½ of the Actuarial Cost of Their Pensions. Employees Shall Pay at least 12% of the Cost of Health Care Plans. The monthly cost of health insurance for, respectively, individuals and families, moving from the lowest to highest premium cost is as follows: $84/208, $122/307, $226/567. Collective Bargaining Limited to Wages. Employees are barred from bargaining collectively over “any factor or condition of employment except wages.” While health care, safety etc. are taken off of the bargaining table, “such strikes are prohibited.” That is, workers are explicitly prohibited from striking over this issue. Union dues shall not be withheld from paychecks. Unions will have to collect dues themselves. Contracts will expire if representatives do not receive 51% of votes in annual elections. Annual elections shall occur for union representatives. “If no representative receives at least 51 percent of the votes of all of the general employees in the collective bargaining unit, at the expiration of the collective bargaining agreement…the general employees shall be nonrepresented.” A runoff election may be called for. Refusal to Bargain Collectively. An employer may refuse to bargain collectively by claiming to doubt that the union has the support of at least 51% of its employees. The employer can call an election to prove that fact and is not required to bargain collectively until after it has been proven. During a Governor-Declared State of Emergency Workers Have No Right to Strike. Three days of unexcused absence from work, participating in a strike, sit-in, sit-down, slowdown, sick-out, or any other concerted labor action during a governor-declared state of emergency is ground for employee discharge. Undocumented Residents are Ineligible for Medical Assistance Benefits. Department of Health Services and Other Service Providers Shall Lose Millions of Dollars. Money allocated to community aids and medical assistance programs ($3,100,000) as well as inter- and intra-agency programs for children and families ($2,011,000) will “lapse” into the general fund. On top of that, $43,664,200 of block grants for services will be turned into earned income tax credits. Still, even after cutting into the wages and social programs that poor and working people depend on, Republicans are looking for another $99.5 million to give away to the wealthy in the form of tax cuts and tax credits. Until then, this state will experience a “budget deficit” of that amount. With the $165 million bond payment coming due Republicans are still hoping they can refinance on the municipal bond market (adding $42 million in interest payments over ten years) to resolve the deficit. This should be put into perspective: $165 million represents only 0.5% of Wisconsin’s total budget. For an investment bank awaiting payment this is “inconsequential,”· meaning there is no reason to worry that payments will not be made on time and no reason to refinance either. At the same time, that is in part the case because investment bankers expect us to pay for it through cuts to social programs. In short, Republicans plan to give more to corporations here by borrowing from Wall Street at the cost of $42 million. SB 11 must be understood as it sits within its political-economic context. First, the atrocious cuts that Walker is proposing in his budget are to be paid for by wrenching money out of the now disabled public sector workers. That is why busting the union was essential to his budget. That fight is already upon us, ready or not. Second, there is no reason to believe that the economy has restructured in such a way as to begin a sustainable round of growth. When the economy dips back into recession we can expect attacks like this to spread like wildfire. If the ruling class lacks a consensus opinion on Walker’s attack it is only thanks to Wisconsin’s popular revolt. There is the well-understood threat of these measures spreading to other states, and I would argue that we must be looking even further down the road: these measures could one day soon be extended to all workers. This is not the end of the capitalist class offensive against workers—unless we stop it! 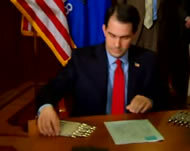 Walker signed SB 11 on Friday morning. The next day saw the largest demonstration to date—some estimated over 200,000 people participated. This was not an angry or defeated crowd: people are determined to carry this movement forward. One woman’s sign confidently stated, “You won the battle but we will win the war.” The following is a brief outline of campaigns that are already underway and some analysis of their strengths and pitfalls. Recall drives are among the most prominent efforts already underway and seem to represent most people’s greatest hope for victory. Indeed, the recall would empower constituents in relation to representatives and their corporate sponsors and would enable a more active and responsive practice of representation. Nonetheless there are two reasons why the recall efforts are insufficient. First, recall efforts will inevitably turn into campaigns for the Democratic Party, which has all along attempted to capture the independent energy of the movement for its own benefit. Second, Walker won’t be recalled for another year and the state representatives have until November. By then Walker’s budget proposal will have been implemented. There already are numerous legal challenges to the bill but they face some of the same problems as the recall effort. Even if they are successful they do nothing to empower the working class or oppressed people; these campaigns will do little to nothing to unite people. It is up to the DA to investigate and follow through with the matter–though we can pressure the DA to do so. “General Strike!” was among the many furiously chanted slogans outside the Senate chambers while they voted to pass SB 11. It was a threat that sounded powerful; but it takes much more than fury to stage a general strike. While there have been a couple education committees organized to inform union members about what a general strike entails, and it is the talk of the town in Madison, there are no indications that this will happen any time soon. As of now, there do not seem to be any intermediate plans for labor actions. However, National Nurses United is leading a coalition of union members in a “No Concessions” campaign as a way to voice rank and file opposition to the union leadership’s weak bargaining stance. On Saturday after Walker signed the bill they had a vibrant presence at the march in Madison and they seem to be prepared to regroup to continue building a rank and file movement. A number of other ideas being floated included targeted boycotts and pickets of corporations that supported Walker. Lastly, a number of liberal, progressive and labor organizations joined with former Green Party candidate Ben Manski to form the Wisconsin Wave. This was a state-wide organizing project that Manski began before the protests started but which has taken off since. 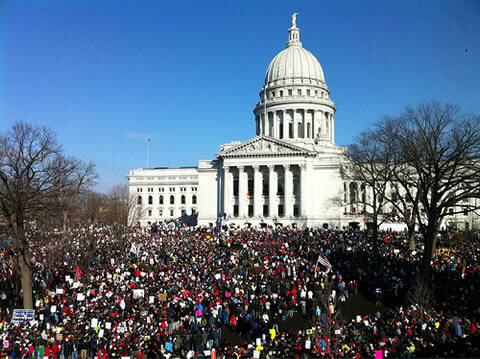 The Wisconsin Wave has so far called for a statewide day of action on March 13th. Regardless of their efforts, there have been heated protests across the state of hundreds and even thousands of people in towns as small as Washburn. Their platform calls for returning corporate taxes to a reasonable level in order to fully fund public sector services. What’s exciting is that they are independent of the Democratic Party and they have a ‘tax the rich, fully fund the public sector’ platform that is well suited for fighting the upcoming budget in Wisconsin, and maybe Obama’s as well. While governor Walker’s agenda targets people of color, the poor and the working poor—in addition to public sector workers in general—the demographics of the protests in Madison are overwhelmingly white and speeches and signs frequently refer to saving the middle class. This issue—the whiteness of the protests as compared to the diversity of the victims—was raised at a recent panel discussion sponsored by the Labor and Working Class Studies Project. “We will not win,” argued Monica Adams of Freedom Inc., “without everybody.” Freedom Inc. is a Madison-based people of color social justice organization that has already been involved in the movement by having a brief but organized presence at the capitol occupation and by attending meetings for the Wisconsin Wave. Monica pointed to the barriers that will have to be addressed in order for people of color to truly ally themselves with the movement. Public education, for example, systematically fails African Americans—predominantly black schools have always been plagued by the problems associated with under-funding. So, “why would I fight for a school system that fails me?” And, she wondered, if people of color organize for workers rights can they expect the same support for public housing? Ultimately the question she was driving at was, “Are we allies? Or do we just share a common enemy?” I would add that school closures and privatization schemes have been a flashpoint for African Americans in both Chicago and Minneapolis. These privatization schemes depend on busting teacher’s unions. If we can create a space for open and multi-racial dialogue on these issues, and move beyond reactionary demands about protecting the middle class, then we might be able to form a meaningful alliance that will expand the base of the movement. 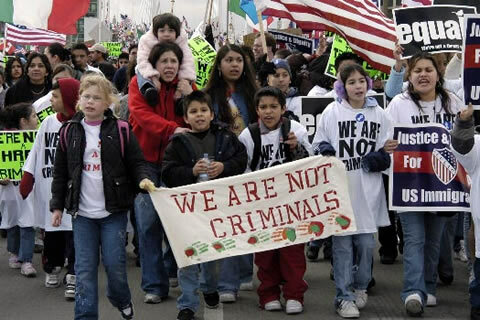 On May Day, 2010, 65,000 Latino immigrants marched together in the streets of Milwaukee to protest racist, anti-immigrant legislation in Arizona. Republicans have already drafted a similar anti-immigrant bill for Wisconsin and have excluded undocumented immigrants from receiving state medical assistance. Walker’s agenda will threatens the health and the security of immigrant workers. Voces de la Frontera, a Milwaukee immigrant rights group, has already been sending busloads of demonstrators to Madison. If public sector workers and their supporters can show solidarity with immigrant workers by fighting against racist legislation in Wisconsin they might succeed in uniting the two most energetic and mobilized working class movements in the country. It is clear that the Budget Repair Bill lands a serious blow to the organizing capacity of unions and Walker’s budget, as much as Obama’s, is an attack of enormous magnitude on poor and working people’s livelihoods, health and strength. But none of this is inevitable and Wisconsin’s uprising likely is a sign of what’s to come.